Spins in place and idles about. This pet was introduced in the 6.0 patch leading up to the release of the expansion, Warlords of Draenor. Players must complete a quest chain in a revamped level 90+ portion of Blasted Lands, before returning to Stormwind or Orgrimmar to claim the pet. The Iron Starlette is a pet-sized (and less deadly) version of a Kor'kron Iron Star, a large mechanical weapon used by engineers during the Garrosh Hellscream encounter in the Siege of Orgrimmar raid. 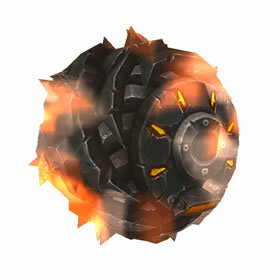 Second use: Unleashes a flurry of attacks, dealing 886 Mechanical damage. Roll at the enemy, dealing 295 Critter damage and increasing your speed by 20%. Covers the enemy team in toxic smoke, dealing 315 Mechanical damage instantly and 98 Mechanical damage every round for 2 rounds. Persists through pet swaps. Increases the damage of your next attack made within 1 round by 125%. I named my Iron Starlette Ragnarok, and for good reason. Any pet, ESPECIALLY Beast pets (when not classified as elite or otherwise unable to take more than a certain amount of damage per attack, such as Magic pets) can almost always be killed instantly with the Windup/Supercharge/Windup combo. This little devil quickly became an integral part of my pet arsenal for his sheer destructive power, and remains to be one of my favorite pets to use. I just finished this quest chain on my level 115 character, 10/24/18 and received my Iron Starlette (H/P). Take the portal to Blasted Lands in Orgrimmar and Thrall should be right there when you arrive. He and another guy will have the quests you need to start the chain. Iron Starlette is fantastic in a good half of the new bfa WQ battles. Regularly takes out 1.5+ of the enemy 3, makes all of the fights simple to win. P/P is the only breed that matter with the Starlette, I have 3 of them and sometimes just use all 3 at once for the ultimate glass cannon. The fact that the windup/supercharge/windup release hits consistently for 1900 to 2700 damage makes this thing insanely OP, especially when you consider it has a free revive racial. Can confirm pet is still available from quest as of 8/9/2017. Thing people are failing to mention are the quest starts at the Shattered Landing for the Horde from Thrall (I assume Alliance starts at Shattered Beach Head) which is where the portal to Blasted Lands puts you at. Can you say Auction House! It seems rediculous to me that this pet comes in multiple breeds, given that, as far as I know, you can only get one per character. You can repeat the quest on alts, but you have to be at least level 90, so finding the breed you want might take a really long time (unless you get lucky). Wasn't the quest removed out of the game and is now unobtainable but through trad. So, i can run the quest chain again and again until i get the breed i want, is that it? Picked up 2 of these today. The first was a P/P so I'll keep that one. The second was mixed breed, so that will go up for auction. Now to snag an H/H. One of my favorite pet battles, part of my 'official' team with Graves and Sentinel's Companion. Great on Menagerie quest and against some Pandaren Spirit's. Besides that, looks amazing!! The H/H breed is the most rare. I like it the best because no one can kill it in 3 rounds. It will come back to life at round 3 and wreak havok. However the P/P is so deadly with Wind-Up - Supercharge - Wind-Up. That last wind-up does so much damage that it will take out most everything except an elemental. If anyone needs this pet and is struggling I dont mind giving my spares out. Alliance/Horde Azjol-nerub. Yes, still available. Just got it today. Go to Blasted Lands and complete quest chain there. For anyone trying to obtain this pet Post-6.2, you CAN still get the pet. Lv. 90+ required. You'll need to either have completed the beginning phased sequence of Tanaan or not taken The Dark Portal questline at 90 yet. For Horde & Alliance: Take the portal in your mage quarter to the Blasted Lands--not Hellfire. You'll be sent to a base camp. There should be quests available from a couple NPCs. Do all of them. Follow the questline until you receive the pet. Where do you start this quest chain? As of the time I am writing this, the questline to get the iron starlette is still open. I just got it today. This massive weapon of destruction has been miniaturized for use in the garden. Moles beware!